Did you know that the use of evergreen trees to celebrate the winter season occurred before the birth of Christ or before the first Christmas, that the first recorded reference to Christmas trees appeared in Germany in 1531, that using small candles to light a Christmas tree dates back to the middle of the 17th century, and that since 1966, the National Christmas Tree Association has given a Christmas tree to the President and first family for display in the Blue Room? Live Christmas trees have been sold commercially in the United States since about 1850. 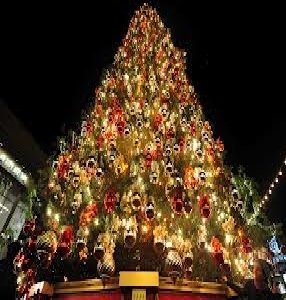 The first Christmas tree retail lot in the United States was started by Mark Carr in New York, in 1851. From 1887-1933 a fishing schooner called the “Christmas Ship” would tie up at the Clark Street Bridge in Chicago and sell spruce trees from Michigan to Chicagoan’s. In 2011, 31% of real Christmas trees sold were from chain stores or garden centers, 31% from cut and harvest farms, 14% from retail tree lots, and 13% from non-profit groups. In 2011, 84% of the Christmas trees purchased were pre-cut, and 16% were cut-your-own. An estimated 175,000 real Christmas trees are sold via e-commerce or catalog and shipped mail order. 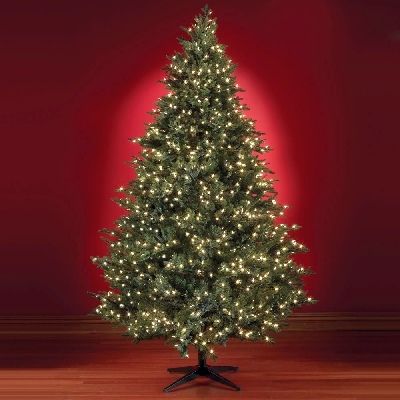 The most popular Christmas trees are: Scotch pine, Douglas fir, Noble fir, Fraser fir, balsam fir, and white pine. Helicopters help to lift harvested Christmas trees from farms. In the United States, there are more than 12,000 Christmas tree growers. Nearly 300 of these are in Illinois. There are approximately 350 million Christmas trees growing on U.S. farms. Approximately 100,000 people are employed full or part-time in the Christmas tree industry. 30.8 million live Christmas trees were purchased in the United States in 2011, with a real market value of $1.07 billion. The mean average purchase price of a live tree in 2011 was $34.87. Oregon, North Carolina, Michigan, Pennsylvania, Wisconsin, Washington, New York, and Virginia were the top Christmas tree producing states in 2009. Oregon was the leading producer of Christmas trees with 7.34 million trees in 2008. 170,000 acres of land in the United States were in Christmas tree production in 2009. Oregon led the nation with 40,000 acres, and Illinois 2,000 acres in production. Christmas trees are grown and harvested in all 50 states. Michigan ranks third (1.6 million trees in 2007) among all states in the production of real Christmas trees, but grows a larger variety of Christmas trees than any other state. 93% of real Christmas tree consumers recycle their tree in community recycling programs, their garden or backyard. In the United States, there are more than 4,000 Christmas tree recycling programs. Recycled real Christmas trees have been used to make sand and soil erosion barriers and been placed in ponds for fish shelter. Christmas trees can remove dust and pollen from the air. Cook County, IL uses old Christmas trees to rebuild housing structures for natural wildlife that has been destroyed through development. An acre of Christmas trees provides the daily oxygen requirements of 18 people. You should not burn your Christmas tree in the fireplace; it can contribute to creosote buildup. Live Christmas trees are involved in less than one-tenth of one percent of residential fires, and mostly when ignited by some external ignition sources. The major factors involved in Christmas tree fires are electrical problems, decorative lights, candles, and a heat source too close to the tree. In 1971 the government concluded that Christmas tree tinsel made of lead was a health risk and convinced manufactures to voluntarily stop producing lead tinsel. It is now made of plastic.